A mission is a job offered by an non-playing character to a player which requires the player to accomplish a set of objectives in exchange for a set of rewards. There are three standard types of missions: Security given by security agents, Mining given by mining agents, and Distribution given by distribution agents. Security missions are for the combat oriented pilots. The job is usually to kill pirates, retrieve stolen goods or to destroy strategic targets. These missions have the highest rewards but they are also slower and involve risk of dying. When people talk about missions they usually mean security missions. Mining missions are given out by Mining agents and require you to mine an asteroid or set of asteroids and bring the ore back to the agent's station. There is a risk of combat in mining missions, though the "belt pirate" NPC hostiles that show up are usually rather weak. Note that Mining missions pay off in ISK and Loyalty points, you do not get ore from Mining missions. See mining missions for more details. Distribution missions require the movement of a cargo from one station to another. Distribution missions never require combat, though, of course, you may encounter PvP combat on the way to your destination. Distribution missions are fastest mission type to run so they are sometimes used for fast standing gains. Mission levels go from low to high: 1 to 5. As you go up in level, the missions generally require that you have more skills and access to bigger ships, but they also provide better rewards. The level of a Mission Agent tells you the level of missions that the agent will offer. Each agent offers only one level of missions. Level 1 is where most new players start. Most, if not all, level 1 missions can be done in a basic frigate, Only the most basic piloting skills are required. Level 2 mining missions stepping up from a frigate. These missions generally expect that you are continually improving your piloting skills and learning how to fit out new ships. Level 3 missions require a battlecruiser, a mining barge, or a medium-sized industrial ship. These missions go faster if you have trained for better ships and at least some Tech 2 fittings. Level 4 missions require a Battleship, an Exhumer, or a large industrial ship. These missions can be time-consuming, but they offer large rewards. Level 5 missions are designed for groups of players or capital ships and are exclusively located in Low Security space. You must meet this requirement for either the agent's personal standing towards you, their corporation's standing towards you, or their faction's standing towards you; any one of the three will suffice. All three standings need to also be above -2.00 to receive higher than L1 missions. Eveynel Daerne's personal standing towards you is 3.0 or higher. Transstellar Shipping's standing towards you is 3.0 or higher. The Gallente Federation's standing towards you is 3.0 or higher. The fact that Eveynel Daerne is located in the Orduin solar system, which is the sovereign territory of the Minmatar Republic, is completely irrelevant. High Minmatar Republic standings will not give you access to missions from Eveynel Daerne. This concept applies as a rule to all agents of a faction who are located in a different faction's sovereign space. Standings are a measure of how much one entity in EVE likes or dislikes another. These feelings are measured on a scale from -10 to +10 where negative is hatred and positive is love. Completing missions changes your standing with the agent, the agent's corporation, in some cases the agent's faction and, in security missions, the faction of the entities that you kill. The standings of NPC entities toward a player are important for a couple reasons. Firstly, because higher standings make more profitable missions available. And secondly, because several perks become available when an individuals or player-run corporations standings are higher with a specific entity. Be aware: security missions can make your standings go up with one faction and simultaneously down with another. Repairing poor standing is hard work so it is very much recommended that you don't accept missions against empire factions too lightly. Agents' standings are determined in part by your standing with their parent corporations. Because of this, there is an advantage to running your missions with the agents from same corporation. Each completed mission will raise your standing with that agent and the agent's corporation and move you more quickly towards the next level. In addition, because Loyalty Point stores are run by corporations, you will be able to buy more items faster if you stick with one corporation. When you complete a regular mission for an agent, you get increased standings with the agent and the corporation, but not the faction. It is worth noting that if the mission involves destroying ships or structures of a different faction, then your standings with the target faction go down due to "Combat - Ship Kill". Those who wish to be able to fly in all High Security space are advised to decline all anti-Empire missions (that is, anti-Amarr, anti-Ammatar, anti-Caldari, anti-Gallente, anti-CONCORD and anti-Minmatar). Some exceptions or workarounds exist; for example, a Minmatar agent might give you the mission Friendly Spies, where if you destroy the mission objective but none of the hostile ships, then you don't lose Gallente Federation standings. In other cases, the standing losses due to "Combat - Ship Kill" are almost insignificant, such as Amarrian Tyrants (Level 3). Some missions, though, will incur -2.4% standing losses for ship kills and might require one or more completed storyline missions for the opposing side to repair the standings losses. To see a history of how your standings have changed, you can go to NeoCom > Character Sheet > Standings, scroll through the list of NPC entities and select the entity you are interested in to see how much your standings went up or down for what actions and by how much. Note though that due to a bug the graph presented shows wrong values (jan 29 2018). See NPC standings for more details. Completing missions will reward you with isk, loyalty points and standings. Being paid with isk is clear for everyone but new missioneers often forget about the Loyalty points that they gain whilst running missions. Loyalty Points are a currency that you receive from the Corporation whose agent gives you a mission. These points can be used to buy things at the Corporation's store. These points (plus a small amount of ISK or items) can be exchanged for valuable items in the Loyalty Points store of the mission agent's corporation. For some players it is more profitable to accumulate Loyalty Points in order to exchange them for goods which can then be sold than it is to kill, loot and salvage in security missions. See Loyalty Points for more details on what to do with LP. This means that an agent in 0.5 security system pays 80% more than an agent in 1.00 security system. Note that the systen security used here is the true security of the system. The rewards are also dynamically adjusted based on past completion data. This dynamic calculation affects isk payout, LP payout, bonus reward and timed bonus reward. Gaining improved standings with agent, corporation or faction can also be lucrative. With higher standings you will be able to take higher lvel missions, pay less broker fees in NPC stations and get cheaper refining in NPC stations. See NPC standings for all advantages of standings. You will also receive isk from bounties while killing NPC in combat missions. You will often get mroe isk from bounties than from mission reward. You will also be able to loot and salvage the wrecks though it is often more profitable to skip this. As you continue to complete missions, you will occasionally get a Storyline Mission offer from a special Storyline agent. In fact these offers will happen exactly every 16th mission for same factions. This agent will suddenly contact you from a station, however, you may need to travel to the agent's station in order to accept the mission. Once you are in touch with the Storyline Agent, you accept and complete the mission in the usual way. If the closest Storyline Agent has already made you an offer that you haven't accepted or declined, then it will be the second-closest Storyline Agent that you get the offer from. If the agent who gave you the 16th regular mission that you completed was in High Security, then the Storyline offer will always come from a Storyline Agent in High Security. You cannot work for a Storyline Agent unless you've received an offer from that Agent. Completing a Storyline Mission gives large increases to your standings with the agent's corporation, and moderate increase to faction standings. Note though that you will also get derived standings, both positive and negative. So if you keep doing Storyline Missions for Minmatar Republic you will find that Gallente Federation will also like you while Amarr Empire, Caldari State and various pirate factions will gradually start to dislike you. When trying to increase standings with a particular NPC corporation, it is possible to plan your missioning such that when you hand in your 16th mission, you get your offer from the Storyline Agent of the corporation that you are focusing on. The "decline mission" timer tells you how long you have to wait until you can decline another mission from this agent without losing standing. Declining a mission for a particular agent more than once every four hours will also cause a standings loss with the agent, corporation, and faction. Also running out of time on a mission you have accepted will cause a standings loss with the agent, corporation, and faction. If an agent you recently declined a mission from offers you another undesirable mission, you can click DELAY, wait out the four hour timer while you go do something else, and then decline. Note: Anomic missions can be declined and cancelled with no penalty. They also won't count for the 1/4h declining limit. You can search for agents in the agency window. These mission types are not as widely available as the basic three. Career missions, also know as Tutorial missions, are missions that are supposed to help new players learn how to play EVE Online. 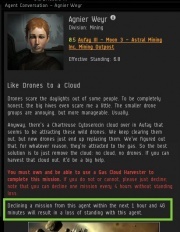 It is a good idea to do these tutorials when you first start playing EVE, as they give valuable ships and equipment, and the increase your standings with the faction offering the missions. Each player character can only do each Tutorial Mission from a given Tutorial Agent once ever, but the tutorial mission chains do count as Storylines in increasing corporation and faction standings. Research missions are a part of the Industry career path. Instead of Loyalty Points, these missions award Research Points that can be used to buy datacores from the agent who gives the missions. You will need to have trained various Science knowledge to the level required by an agent before he or she will offer you the mission. 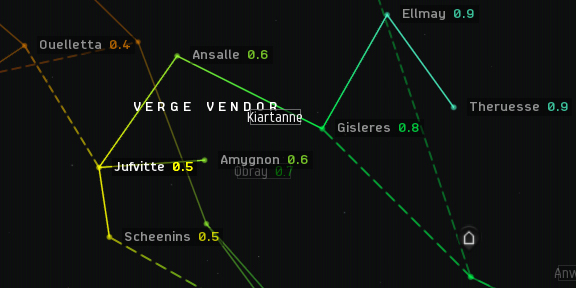 Datacores can be sold in the Market, and some players run these missions to make ISK from trading. Most players, however, have not trained the science skills that these missions require. Epic arcs are long series of missions. Throughout the arc, you will be offered choices which will branch the arc in one or more directions, and thus the arcs have different outcomes depending on your choices. The missions that make up these arcs typically have very good ISK rewards and the last mission of the arc typically carries a handsome reward. There are seven Epic Mission Arcs. Most players begin with The Blood-Stained Stars, an arc that can be completed in a T1 frigate and gives a boost in standings withe Sisters of Eve. Seasoned L4 runners will be doing the four empire epic arcs while the fearless pilots can do the two pirate epic arcs. Epic arcs can be repeated once every three months. Anomic missions (also known as "burner" missions) are optional security missions that are given out by level 4 agents. They can always be declined without penalty. Anomic missions present a different and higher challenge compared to other security missions. You will encounter a small number of very powerful adversaries and you are restricted in ship size. These missions require specialized and expensive ship fits and high skills to solo. They also require piloting skills that are otherwise rarely used in PvE such as overheating. COSMOS missions are special missions found in certain regions of space. These missions vary wildly in difficulty from easy L1 to harder-than-usual L4. Unlike normal missions these missions require faction standing to accept. The COSMOS missions can be completed only once. Members of a fleet who run missions can share all of the standings, LP and ISK reward from the mission and bounties automatically. Loot, and/or salvage can be shared by hand. This is especially good for newer players, as they generally gain more standings than they share. There are two main kinds of mission fleet: Spider, where everyone runs their own missions, but shares standings, etc. at the end; and Locust, where the fleet members all work on the same mission together. Read the article on Mission Fleets for more details. In addition to all the ship, piloting, fitting and combat skills you may need there are also skills that are more focused to missions and standings. There are four skills that improve your standings. These skills neve apply simultaneously. Connections - 4% Modifier to effective standing from friendly NPC Corporations and Factions per level. Does not apply to criminal factions. Criminal Connections - 4% Modifier per level to effective standing towards NPCs with low Concord standing. Only applies to criminal factions. Diplomacy - 4% Modifier per level to effective standing towards entities that have negative standings with you. Social - 5% bonus per level to NPC agent, corporation and faction standing increase. There are four skills that improve the payout from missions. Distribution Connections - Improves loyalty point gain by 10% per level when working for agents in the Distribution corporation division. Mining Connections - Improves loyalty point gain by 10% per level when working for agents in the Mining corporation division. Security Connections - Improves loyalty point gain by 10% per level when working for agents in the Security corporation division. Negotiation - 5% additional isk pay per skill level for agent missions. If you're new to mission running and your goal is to gain loot, or pile up loyalty points to buy things, or to increase your standing with a faction, then you may want to lay out a plan to help you run your missions with a minimum of down time. Here are some suggestions. 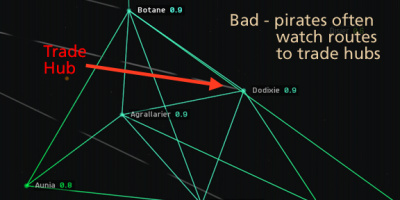 The last thing you want is to be running missions in the middle of a contested low sec region where combatants will shoot at you, or in systems that lie on a busy trade route where pirates will gank you. Use the map and look for a group of fairly high security systems set off from the major trade routes. 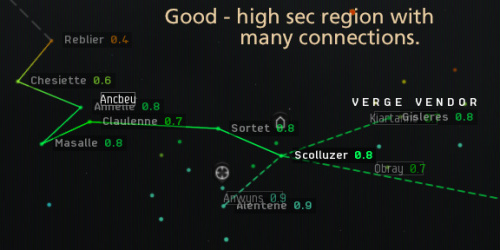 It's also nice to have multiple star gates nearby, just in case you need to run for it. But do not wander too far from your corp mates if you are in war as the war targets will gladly destroy a lone mission runner. Successful mission runs give you ISK and Security missions can also give you loot. They also give you standing with the agent that gave you the mission and the agent's corporation, and the agent's faction. And, they give you loyalty points that can be redeemed for items in the corporation's store. Most corporation stores sell the same sets of augmentation implants. However, different corporations offer different sets of skill upgrade implants, and different factions offer different modules, hulls and ammunition. Roden Shipyards, for example, sells warp drive and astrometric skill upgrades, while Astral Mining offers mining upgrades. Weapons and ammunition offers correspond to the faction's spaceship preferences - Minmitar offer projectile weapons and ammo, while Ammar offer laser weapons and crystals, and so on. Nearly every station has at least one agent, and there are many duplications in terms of standings and items offered for sale. So if you want to improve your standing with the Gallente, for example, and you want to buy some mining skill upgrades, then Astral Mining is one of the corporations you would want to consider. Since there are many Astral agents in Gallente space, choosing this corporation will not restrict your choice of star systems all that much. Once you have a goal in mind, use the Agent Finder to narrow your choices of star system. Keep in mind that when you finish running level 1, you will almost certainly have to move to a new system to find a level 2 agent, and again for level 3. So try to find a group of level 1-2-3 agents that are fairly close together. To avoid unfavorable missions such as low security missions and missions that require you to kill empire ships you will need to decline missions every now and then. It is best to choose yor location so that you have second and even third agent as backup once you can't any more decline the mission offer from first agent. You need a base because as you go along, you will buy ships, ammunition and other gear, and you will pick up loot and junk from completed missions. It's easiest to keep all this stuff in one place, so plan to go to your agent's base to run missions, and fly back to your base when you need to resupply. It is often best to bring all the refit modules and extra ammo to the station with agent so you don't need to jump around more than is needed. 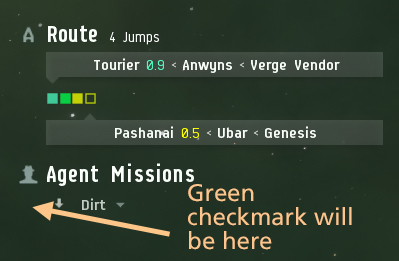 If you think the mission is finished, but you don't see the green checkmark, or if you're not sure what you need to do to finish, click on the little down-pointing arrow beside the mission name and select "details" from the menu. This will show you the mission statement and you can see what you still have to do to complete it. Note though that some missions may not get this completion mark. The first rule is to never fly what you cannot afford to lose. Even distribution missions can fail if you get ganked. So fly the cheapest ship that will do the job. Know also that NPCs in missions tend to be very predictable in their setups. For example, Gallente and Serpentis use only Kinetic and Thermal damage against you, but are also most susceptible to Kinetic and Thermal damage themselves; when they use any form of EWAR, it's always sensor dampening. It helps quite a bit if you set up your ship to deliver damage that the NPCs don't like and defend against what they will throw at you. Check out NPC damage types for a full description and a handy chart that you can keep in your Neocon Notebook. This page was last modified on 22 February 2019, at 12:29. This page has been accessed 488,669 times.